I picked the "best" time to break my ankle. I teach, and it's summer. I was completely off work the first two weeks of my injury, so I followed orders and basically did not move. But I was starting to get a little unhinged, so I was looking forward to getting back to work--even if the prospect of parenting, working, and commuting without being able to put down my left foot was a little terrifying. For me, breaking a leg was getting expensive in a hurry, but there were some expenses I just couldn't see any way around. On the other hand, there were some quick fixes I used to cut costs where I could. Here's a list of what I had to buy and what I ended up making do. Get a knee walker. If you have to be on your feet for any length of time or distance, crutches just aren't that practical of an option, especially since you can't carry much with them. Just waiting for the elevator on crutches would wear me out. 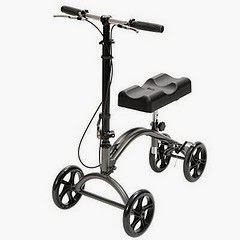 I got this one, and it works well, doesn't tip over, turns easily, and isn't too heavy to get in and out of the car while balancing on one leg. You can rent them from some pharmacies, but--for me--the cost of renting for the 2-3 months I'll be needing it was the same as purchasing it outright, so I did that. Don't just depend on one mobility device. They do different things. The knee walker (or even just a regular walker) isn't going to get you up and down stairs. Crutches will. You can rent those cheaply at Walgreens or Target. Get a shower chair. Maybe you can make do with a plastic lawn chair, but my bathroom is tiny and awkwardly shaped, and having the grippy feet on the bottom of the legs leaves me with a little shred of security as I balance precariously with one trash bag-clad foot hanging over the edge of the tub. Do you remember in college how you'd put your booze in the freezer because it would get cold without actually freezing solid. Well, this tip uses all of the science and none of the fun. If you dump some rubbing alcohol in a ziploc bag with water and freeze it, you'll have a nice, malleable ice pack that lasts a long time. Double bag it. There's a recipe here, but I just dumped some in, probably 3:1 water to alcohol, and it works great. 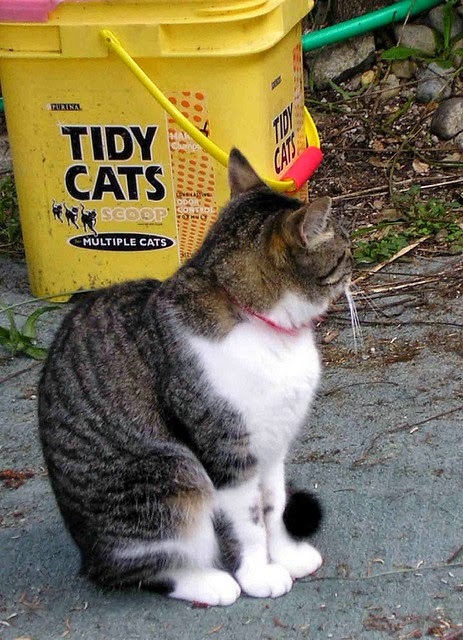 For some reason, I've been hoarding the buckets my cat litter comes in, feeling that they had a utility that I had not yet discovered. Well, I was right! A Tidy Cats bucket with a towel on top is the perfect height for me to put my knee on and voila! Now I can stand at the bathroom counter and dry my hair without striking a flamingo pose. I can make dinner, put up dishes, or just take a few seconds to rest when I'm on crutches around the house. Make use of small baskets to keep the things you need the most near the bed/chair where you spend most of your time. Put chap stick, lotion, the remote controls, medicine, a hair brush, deodorant, etc. in it. You don't want to have to get up as soon as you've settled in with a properly elevated leg and an ice pack. Leash your kid. My husband has been doing all of the daycare drop-offs and pick-ups, which is exhausting for him and my daughter, who now has to stay at school three or four hours longer than she usually does. In order to safely be able to walk with her while I'm on crutches and can't hold her hand, I bought one of those backpack leash things that I always swore I'd never use. Now is not the time to hold stubbornly onto the image of the parent you thought you'd be. Use backpacks. You can't carry things on crutches. Some people have successfully created little pockets on them, but I am not crafty and I am clumsy, so I prefer backpacks. I moved the contents of my purse to the front pocket of a backpack so that I have everything I need with me in one place when I get to my office. Then I put one of those little drawstring backpacks into the bigger backpack so that I can take just what I need during the day. Give yourself a break. I went from taking my daughter to the park several times a week to sitting on the couch watching My Little Ponies with her. I went from cooking homemade meals every day to eating Qdoba takeout. I went from standing during my entire two hour class, walking around and checking in on my students individually to spending most of it sitting at the front of the classroom. I went from running several miles a week, going to roller derby practice twice a week, and squatting 150 pounds to lifting 5-pound dumbbells while I sat in bed. And every single one of those things felt like a defeat. But while staring down three to five months of recovery sounds like an eternity today, it really isn't. This is a slice of time that will fade into the background of a large, rich life. Give yourself a break. Find ways to be productive. I could have gotten someone else to teach my summer class because I was injured before it started, but I could not bear the thought of doing nothing for six more weeks. It was taking a toll on me emotionally. I was sleeping all day, crying at random intervals, and generally sitting around in a pool of self-pity and dread. That's not a good recipe for healing. Getting back into the classroom gave me something to focus on other than my leg and the fact that I was sitting still all day long. It forced me to figure out how to get out of the house on my own. It forced me to get up and get dressed every day instead of staying in the same pajamas for 48 hours. Yes, this is a time to take it easy and (as mentioned above) give yourself a break, but--for me--I need some structure and busyness or I melt down. Accept help. If someone asks what they can do to help, don't reply with "oh, I'm fine." Ask them to pick up groceries, bring by a meal, take out the trash, do a load of laundry. These little, daily necessities will pile up fast and what feels like vengefully. If you can afford it, this would be a great time to hire a cleaning service to come in once every couple weeks. Plan everything. You know how when you leave for work you have to run upstairs six times because you took your phone but not the charger and you remembered your gym shoes but not your socks and you left the hallway light on and then you remembered that you need the book on the bedside table? When "running back upstairs" means "crab crawling up the stairs," there is a lot less room for error. Plan. Everything. Think through all of the steps of a successful day and make sure you have everything you need in place. If you're going to the shower, forgetting to bring something and only realizing it after your foot is wrapped in plastic and you're perched naked on the shower chair is maddening. Check then double check. Pretend your life is a game of Diner Dash where you have to time everything out in the right order. Make it a logic puzzle. So that's how I'm balancing motherhood, teaching, and having a broken ankle. Do you have any tips? Have you found having an injury while parenting to take an emotional toll on your kid? What helped? Great post. You are doing really well. Having had chronic immobilising pain for almost a year and a four year old to amuse, I would add: plan games you can play while lying down. My daughter invented a few: with the lights turned off, I shine a torch around the room and she has to 'catch' the light. We also played simple board and card games, did easy craft activities, played Simon Says, blew bubbles etc. The trick for us was to balance games where she could sit still with me (for a limited time) and then jump around (for a longer time - without bumping the bed and causing me pain!